At BCom Solutions, we’ve built a diverse and robust digital tool belt that helps us create a unique strategy for each of our clients. When approaching a new project, we always do inventory on what tools have been working great, and which need to be replaced with something new. 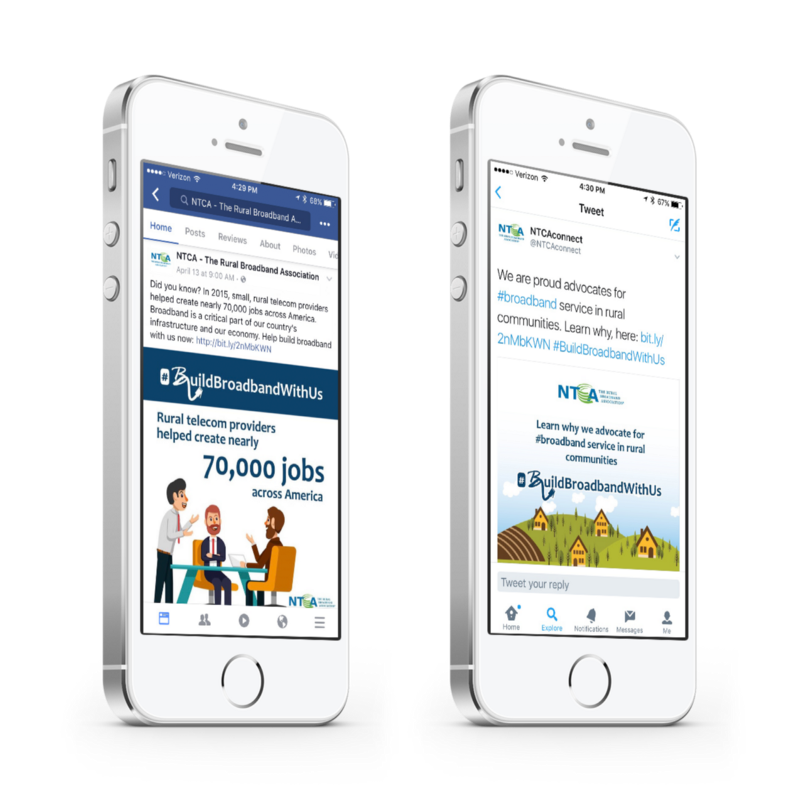 NTCA–The Rural Broadband Association needed a website to house their digital advocacy campaign, Build Broadband With Us. The nonprofit wanted a digital hub where rural broadband providers and their supporters could come together to support equal broadband access for all. Though they got the ball rolling, they were in need of a clever, attention-grabbing way to entice members to join their cause. 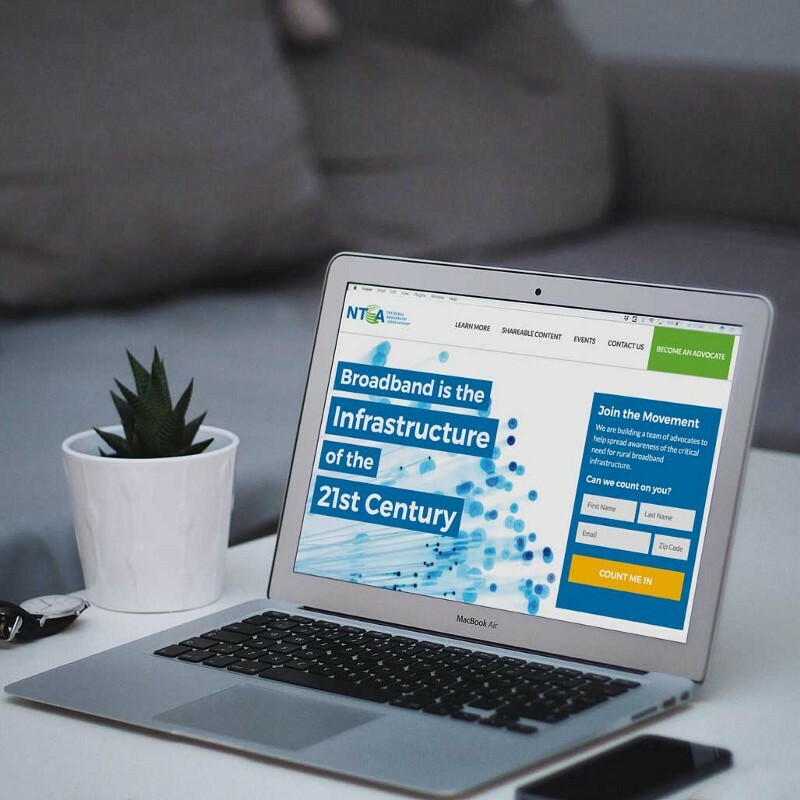 With the beginning of the Build Broadband With Us campaign already taking root, our team’s goal was to utilize our digital tool belt and build NTCA a comprehensive campaign strategy. We knew we wanted to accomplish two things: spreading the campaign’s message further than the audiences it had already reached and delivering results by encouraging member participation. Here are a few of the tools we used to accomplish this. A key element of our work on the Build Broadband With Us campaign was NationBuilder. NationBuilder is a Community Organizing System (COS), meaning it helps marketers like BCom create a virtual file cabinet. By this we mean NationBuilder serves as a platform for our development team to build the actual website and store all the information we need to collect. Our dev team created a beautiful, multi-dimensional website. Not only does it grab supporters’ attention, but it also houses all the information we need, like new contact info, on the NationBuilder platform. NTCA had previously established #BuildBroadbandWithUs for the campaign and was using it when we began the campaign. Using the momentum already established by the hashtag and NTCA, we crafted content that would prominently feature #BuildBroadbandWithUs. This allowed our team the ability to create a listening report around the hashtag that would show us who was using the hashtag, where they were using it, and how they were using it. “Asks” are an important part of any campaign or cause. With a down-ballot race we ask constituents to donate or volunteer. With causes, engagement is a little more tricky. We knew our ultimate goal was get rural broadband supporters to actively join our cause. To us, this meant more than simply visiting the campaign website, but committing to the grassroots advocacy effort by becoming a spokesperson. To provide incentive, our team designed downloadable advocacy kits that included prefabricated social media posts for Facebook and Twitter. Our methodology was to hand advocates the materials they would need to show support, rather than asking them to expend more energy. In return for providing professional quality graphics and social media updates, we asked that supporters share why rural broadband was important in their lives. We later used advocates’ stories for social content for the NTCA social pages. This created a mutual relationship that offered a low-cost reward while yielding a high-return. A key part of our campaign was utilizing email marketing via NationBuilder. Part of the reason we love to utilize tools like NationBuilder is the organization they supply our campaigns. In this case, every contact we collected via the website was stored on the Build Broadband With Us back end. We then were able to categorize contacts as needed and create appropriate lists for email marketing. Some campaigns and causes don’t luck out on having supporters at the ready to help spread their message. Luckily for us, this was not the case for NTCA. In this particular instance, NTCA’s members and supporters became one of our most powerful resources. Without their commitment, our strategy would have looked completely different. We would have had to figure out how to figuratively catch supporters, but in this case all we had to do was reel in the net. Since launching the campaign website in March, we have accrued 3,718 new supporters for the Build Broadband Campaign via the campaign website. The website has had more than 10,000 visitors, to date. Don’t forget that what works for one candidate or cause may not work for another. Assess your digital tool belt and keep your skills sharp for your next big project and always be open to change. Ready to build with us? Find more information about our digital marketing services here.